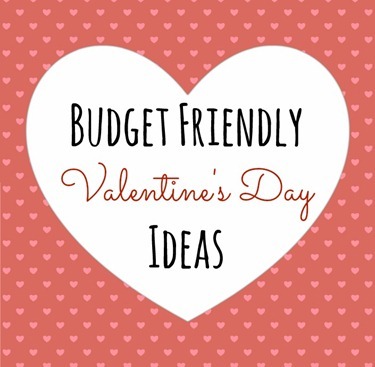 Looking for some creative but budget-friendly Valentine’s Day ideas? Here are some of my favorites (new ideas to share from other blogs and of course, Pinterest)! Hopefully one of these ideas will help make someone you love feel extra special on February 14! 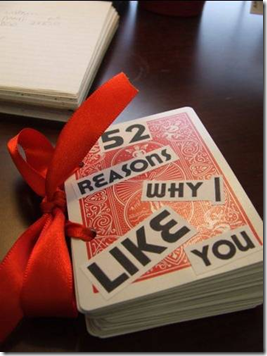 52 Reasons I Love You Deck of Cards: My sister did this project for her boyfriend last year and he loved it! She wrote a different thing that she loved about him on each card. Some were silly, others were really sweet, and the whole thing was really cute! Candy Hearts Poster: I made Ryan a poster that revolved around the sayings found on the candy hearts that are always for sale around Valentine’s Day. It took some time to come up with what I wanted the poster to say since the sayings on the candy hearts can be super hokey, but it was such a fun project. 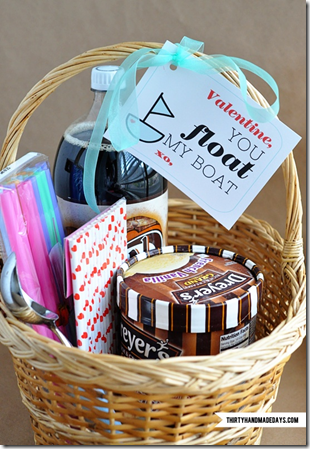 You Float My Boat Basket – This idea immediately appealed to me because Ryan is just a little bit obsessed with root beer floats. It’s simple – you just fill a basket with ice cream, root beer and straws – but still super cute! Framed Keys From All the Places You’ve Lived: A great way to showcase where you’ve lived and the journey you’ve been on together! Now That I’ve Kissed the Ground You Walked On + Trail of Hershey Kisses: I totally stole this idea from a guy in high school who used it to ask a friend of mine to the prom! I placed a trail of Hershey Kisses from the front door of Ryan’s apartment into his bedroom where I had this sign propped up on his bed, along with more Hershey Kisses, the above poster and homemade cupcakes, asking him to be my valentine. 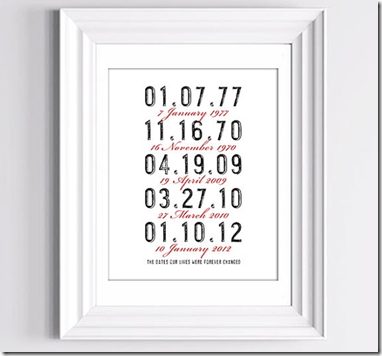 Personalized Dates Poster: Create a fun poster using dates that are significant to you and your significant other. 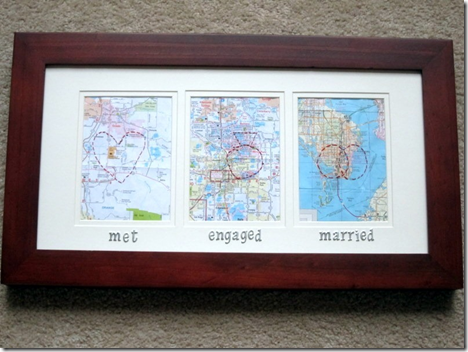 Met, Engaged, Married Embroidered Map: I gave this gift to Ryan for our one-year wedding anniversary. I got the idea from a map project that I saw on Pinterest and changed it slightly to read “Met, Engaged, Married.” (The original read “Met, Married, Live.”) A map of the location of each of these special events in our relationship filled the picture space above the corresponding text. I Love You This Much Handprint Card: My heart melted when I saw this card. I just had to share it with you guys just in case there are any parents out there looking for an adorable Valentine’s Day craft project to do with their kids to surprise a loved one. 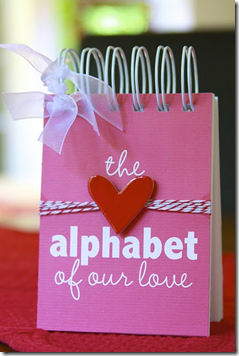 The Alphabet Of Our Love Book: Include a different reason why you love the person you love for each letter of the alphabet! Scrapbook: For our first Valentine’s Day together, I gave Ryan a homemade scrapbook and filled it with photos, captions and admission tickets that captured the first year of our relationship. Be prepared: This takes hours and hours of work. Phew. 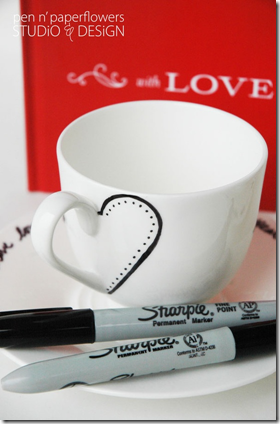 Personalized Coffee Mug or Tea Cup: Use a Sharpie to design your own mug! Add hearts, a favorite quote, song lyrics and more. Simply buy a mug, write away with the Sharpie and bake the mugs for 30 minutes at 350 degrees to let the design set. What is the most memorable thing that you’ve done for someone or that someone has done for you on Valentine’s Day? I love our annual Valentine’s Day Mission! Ryan and I create a small budget (usually $20) and both leave the house at the same time, setting a time limit during which we both have to get each other a bunch of little Valentine’s Day gifts! We have also gone to the mall together and split up for an hour to each buy each other an outfit to wear on a date that evening. Both ideas are a lot of fun! Such cute ideas!!! 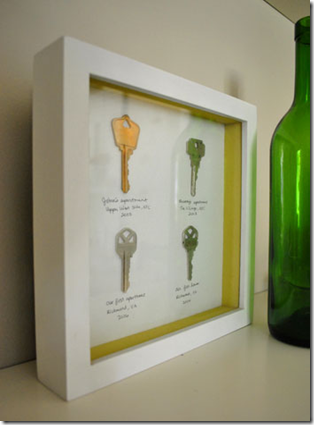 I especially love the frame with all of the keys to the places that you have lived in. It is an easy enough project to put together, but looks very creative and thoughtful. Thanks for sharing so many awesome ideas :). i love that one too! unfortunately i don’t have all of the keys anymore, otherwise i’d be all over that one! This is a great keepsake….. not to self: SAVE KEYS!!!! It could be such a great conversation starter as well. We have lived in some interesting “dwellings”! Okay the keys worry me as I’d hate to think that people had copies of keys from the condo I currently rent. I was thinking about doing the embroidered map this year! I wonder if guys appreciate these things as much as we women do? These are all really great ideas! I hope the ice cream doesn’t melt!! Wow you have some super cute ideas here. I love the “I love you this much” one! Sooo adorable. Sadly, my boyfriend things Valentine’s Day is the worst day in creation and that he doesn’t need a day to tell me he loves me. Oh well. 🙂 I remember all the Valentines we’d have to fill out for school – no one could be left out – and I’d spend hours making sure my good friends got the best ones. It was silly but fun. Aww I’m bookmarking this for when I eventually have kids- I love the hand print cards or having the kids decorate the mugs. I loved crafts when I was little! We just booked a spring break trip so we are doing a $20 limit this year too!! I really like the root beer float idea – simple, but cute and Jonny does love root beer floats yet we rarely have them!! These are amazing ideas! I did the deck of cards last year and my husband loved it! This year I may have to do that root beer float idea! Too cute and so fun! My boyfriend and I don’t really do much on Valentine’s day, except eating in for a “favorite” meal. Over the last three or so years we have tried to recreate our favorite restaurant foods. This year, we have agreed on fondue, and I have found some great ideas on Pinterest. what kind of head phones last three years??? I don’t think I’ve ever had any running headphones that have lasted more than one year, and that’s pushing it! My favorites are the Nike Sport. I’m a distance runner and also do the gym. They used to be black with little rounds that went into the ears (but didn’t stab you in the ear) and had an adjustable piece over the head. It seems that these have been discontinued and since I tried their new style (at Target for about $19.99) that are while and they go around the ear with little piece that goes inside your ear (but doesn’t bother it at all). Best headphones ever! Mine get abused, covered in sweat daily and still are great. I think this pair has been going for about 9 months already and is still great. Highly Recommend Nike Sport. I’m such a sucker for anything related to love, so clearly I get excited about Valentine’s Day! I really like the alphabet book idea and may go with that this year! Our Valentine’s tradition usually involves making a nice dinner together with some sort of delicious dessert. One year I replaced all the tiny pieces of paper that are in the Hershey’s kisses with pieces of paper that I had written on with reasons “why I love you”. I did a whole bag. It took forever to write them (tiny) cut out the strips and carefully unwrap each kiss and replace the paper then wrap it back up. It turned out really cute and my boyfriend at the time really loved it. If you do it I recommend maybe doing 10-12 not the whole bag. Buying each other an outfit for dinner is such a cute idea! Although, I’d be a little afraid to see what my boyfriend would pick out for me! Wow Ryan had some long hair! Cute and sweet ideas! But word on the street is that guys are big fans of March 14th which is apparently the male valentines day….there is a full website dedicated to this nonsense! I think the key idea is the cutest!! I’ve seen different ideas before, but never that one! Awww was Ryan an SAE? I just love it when people meet through the Greek system and end up together forever!! Oh hmm my best valentines day was when I made my BF Barefoot Contessa’s Lasagna (the BEST) and a heart shaped chocolate cake….we ate dinner, danced in the living room and watched a movie 🙂 and although he is in a different state for college now, he is the man I hope I end up with….but, who knows, we shall see! yes he is! and that sounds like such a wonderful valentine’s day! For our first Valentine’s Day, Brian and I had only been together a month or so and I didn’t want to do something expensive. I was a bit of an artist at the time and he kept telling me I should paint him something. So, I casually asked what kind of scene/ subject he would want and when he came to pick me up for dinner I brought him up to my dorm room and unveiled a painting of… the apocalypse. Yep, super romantic. Just what he asked me for! Aw, such cute ideas! I love your $20 time limit idea – what a great way to do v-day quickly and effenciently. This is me and my husband’s first married Valentine’s day. He’s actually on business all week but gets back v-day night. Planning a special dinner, but that’s about it. Love the mall idea.. it would be so fun to pick out each others outfits!! My friend is in a long-distance relationship while she’s at school, and when she last saw her boyfriend she gave him 14 home-made cards so he could open one every day in the lead up to Valentine’s Day. I thought it was really cute and thoughtful. OMG! The root beer float idea is SO perfect for my hubby!!! I typically just grab him some chocolate from Walgreens but this is so creative and he LOVES root beer floats! I want to do something extra special for him this year since I’ve been giving him a run for his money with pregnancy-induced mood swings. Oh the joys. I absolutely love the Root Beer Float idea! Dan and I don’t do anything big for Valentine’s Day, but that is adorable! Thanks for sharing these 🙂 He actually just gave me a personalized dates poster and it is one of my favorite gifts I have ever received. I would definitely recommend it as well! These are really great ideas. Thanks for sharing ! I love the “52 Reasons I love you” idea!! This is ridiculously cute! I’ve never actually been dating someone on Valentine’s Day… haha so I’ve never done anything cute! All of those are totally creative. I don’t think I’ve seen any like them before. So cute!! 🙂 Thanks for posting! These are such great ideas! I love the dates that are significant to you idea. I will have to store these for future (birthday/Christmas) gift ideas because we don’t really do gifts on Valentines. These are such cute ideas! I love the 52 reasons why… Deck of cards, the alphabet book, and the personalized mugs the best! I love the “met, engaged, married” frame! I am one of the dumb ones who thought it would be a great idea to get married on Valentine’s Day. I absolutely hate it. Everything is marked up and it is impossible to make a reservation. So we tend to just not celebrate it. However, I love the $20 idea and I am going to make that frame!!! Thanks for the ideas! I love all of these ideas! My boyfriend and I are celebrating 4 years on the 20th, so we’re taking it low key for V-day, but I want to do it up big for our anniversary! This year, we’re exchanging the cheeziest gifts that we can find, but they have to be under $10. I was able to find fake flower petals, a large felt banner that says “Happy Valentine”, a horribly ugly bear figurine holding a balloon that says “I love you”, and a package of Skor bars. (Ahem, score…um, yeah – that’s kind of Valentines-ish!.) I got it all for $8.50 and will set it out before the hubs gets up on Valentine’s morning. It’s going to be a hilarious surprise! We each make quite good money, but neither of us want to spend very much on such a commercialized “you must be romantic” holiday. I love the mug idea! We’re both big coffee/tea drinkers! The best thing I ever did was your scrapbook idea! I got an expandable one and we’ve added to it over the years. The mug is right up my crafting alley. I made a scrapbook for my mom before for Mother’s Day and they DO take so long to make! I couldn’t believe how much time it takes to cut things out and make it look SO cute! Plus, you have to gather all of the pictures and everything. Phew, what a project! My favorite gift you got Ryan was probably the “Met, Engaged, and Married” picture. I think that’s a really cute and fun idea! i love the met, engaged, married frame. might have to do that one of these days. we’re usually pretty boring on valentines day but i guess the most memorable was the fact that our daughter was conceived on valentines day 2007. These are so cute! I definitely want to use the map idea next year! We typically make dinner together rather than sitting in a crowded restaurant, but I’d love to throw in your last idea- a quick shopping trip before the cooking begins! I’m trying to brainstorm a cute gift for my hubby-to-be from our puppy…any ideas?! These are such cute ideas!!! I love the Hershey kiss one and will be stealing that this year. When I was a senior in high school, my boyfriend was a freshman in college about 6 hours away. I figured we wouldn’t see each other that day, but he rearranged to take some tests and drove down that morning, and walked into my last class of the day dressed in a suit and carrying a dozen roses. It was fabulous. He was a super romantic guy! Love the deck of cards idea and the Hershey’s Kisses one. You’ve got some great ideas Julie! These are some fantastic ideas! I really want to do the map of the places you lived or the framed dates. Valentine’s is just memorable in itself because that’s when my now husband asked me on our first date. We were not supposed to date because we were on the same Young Life Team, so he had to get permission from several people to do it; but it worked out in the end! Last year, I woke up early and made pink pancakes. It was a nice surprise! I love all these! I just wrote a post on this for engaged couples looking to spend less while saving for their wedding on my wedding photographer’s blog. I’m all about being romantic on a budget! Now i want a root beer float, haha. I love the low budget v day gift idea. For me, most of my favorite and “most thoughtful” gifts received have been something little and not expensive or lavish. I’ve dated guys who would whip out their credit card to pay for anything but after the fact i’d realize there was no thoughtfulness there… No matter how nice of a dinner or trip or whatever. That being said about guys/dating… I know there are many commenters here… Does anyone have any “single girl” healthy living bloggers or even fun dating/lifestyle blogs I could also add to my rreader? I’ve found that all the blogs I read are of happily married young women and while that’s great and I do enjoy a glimpse into that lifestyle in my daily reads, it is so vastly different from what I’m living now as a newly single 29 year old woman. We don’t do Valentine’s Day. I have a weird thing against it (but I don’t judge anyone who celebrates it). But one year we were gearing up for a backpacking trip and of course camping gear tends to be browns and greens. Nothing girly at all! My husband found a mini-MAG flashlight in PURPLE and bought it for me. It was totally practical but UBER thoughtful since he knew of my love of purple and the dreary colors of our hiking gear. OH MY GOODNESS thank you for posting this! I’ve been struggling to come up with something to give my man friend since we’re on a tight budget. I love the 52 reasons one! I wish I would have known about the key one earlier so I could have made sneaky copies of our apartment keys before giving them back haha. We’ve only lived together for 2 years but have had 4 different residences so far! It would have been perfect.